Diver watches a whale shark off Malapascua, Cebu, in the Philippines where azure waters make for superb sightings at close range. Cebu has the added allure of some fine beaches but you need to know where to look. FLYING INTO CEBU, depending on which side of the aircraft you're seated, two things become quickly evident as you swoop over the brilliant azure seas. Firstly, there's a beautiful mountain spine running the north-south length of this long, relatively narrow island. Secondly, as far as the eye can see, there are no beaches. What? As the plane descends, you'll spot the traffic-choked smudge of Cebu City, then the factories and concrete of Mandaue (pronounced "maan-daa-weh") City, followed by the flat, barren landscape of the adjoining Mactan Island, where the airport is located. As the plane banks over the derelict hulk of Philippine Dream, a rusting cruise ship whose casinos, discos and karaoke bars were once the toast of the town, you might wonder what on earth you're doing here. This is decidedly grunge. Oh dear. Relax. Things will be just fine. As with most things in the Philippines, don't let first impressions fool you. Swing round the airport cinderblock and dive straight into the colour and kitsch of Cebu. Get to know the place and you'll discover why business travellers and families come back again and again. To begin with, as the large sign at the Mactan-Cebu International Airport assures all visitors, "Cebu is foot-and-mouth disease free." Now that's a start. Step bravely forward. The only tourist who had a serious problem with this advice landed in 1521, without a passport or visa, trying to bag the place for Spain. 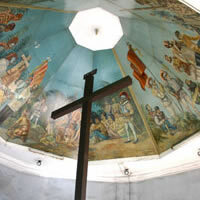 Ferdinand Magellan's round-the-world cruise was rudely ended by local Mactan chieftan Lapu-Lapu whose men ensured the place would have at least two memorable tourist sites – Magellan's Cross outside the wonderful Basilica del Santo Nino (which is said to contain pieces of the original cross he erected in Cebu), and Magellan's Marker on Mactan (where you'll also find a statue of the strapping Lapu Lapu). Lapu Lapu City occupies the north of Mactan Island from where the bridges soar up and over the channel to Mandaue City. Get your bearing with our Cebu Map. Travellers will whiz through the airport in record time – just two minutes with hand luggage and a firm stride. From here, metered taxi transfers to most Mactan resorts will be in the region of 100-150 pesos. With an exchange rate of US$1 = P48, this will not pinch unduly. Several hotels operate shuttle bus services too. The international departure tax at the airport is P550 and the domestic departure tax P200. Departure, like arrival, is cheerful, hassle free, and devoid of the lines and chaos of Manila, unless there's a friendly coup or gun battle on. 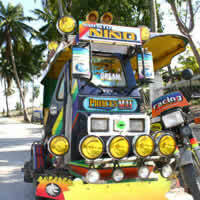 Transport, as elsewhere in the Philippines is a carnival. Brightly painted jeepneys, tricycles and buses, all in gaudy, hallucinogenic hues, looking like battle trucks straight out of Mad Max, careen across the roads seemingly unaware of pedestrians, chickens, dogs and pigs. In some areas of Cebu City you'll also spot gaily caparisoned calesas (horse-drawn carriages) and hubel-hubels (motorcycles that carry pillion passengers). Machismo is ubiquitous. Even the tiny motorised tricycles painted bright green, yellow or purple are bedecked with a menacing array of fog lights. I counted 30 on one. Taxis are metered (flag-down fare is P40 and P3.5 per kilometre) though some regular routes like Cebu-Mactan will tend to operate on fixed rates (P300). Hiring a car with driver through Avis (tel: [63-32] 231-0941, 340-5954) at the airport is around P825 for three hours and then P225 for every hour thereafter. Self drive will set you back P3,350 per day for a Toyota Vios or an equivalent. Petrol is P23 a litre. The car with driver option is mightily recommended as Cebu's chaotic streets and one-ways are not for the faint-hearted. An Avis car with driver is more expensive at a resort but your driver will be fairly knowledgeable and conversant in English. At the Shangri-La the rate is P1,259 for the first three hours and then P530 per hour. For drives to remoter spots on the island rates are higher. Friends Rent-A-Car (tel: 340-5729) is a cheaper option. Cebuanos (as the residents are termed) are a terrific lot. Laid back, friendly, accommodating, chatty and hospitable, they will charm and entertain you relentlessly. Everyone has time. Lots of it. Forget Manila's grit and rough edges, here in the Philippine south, even airport immigration is a pleasant affair and if you're caught in traffic, simply jump out and tuck into some baboy lechon (grilled pork) especially around Talisay City, adjoining Cebu City to the south, or chicharon (chicken or pork skin crisps). Some of the best chicharon is in the town of Carcar, two hours south in the foothills. Mactan is where most of the gleaming four and five-star resorts are to be found, some of them with manicured artificial white-sand beaches that wouldn't look out of place in Hawaii. There are good restaurants, casinos for high rollers and music galore. Everything, from malls to restaurants, is incredibly child-friendly. The island is noted more for its prized "Mactan stone" that is used in surrounding dwellings, than beach. The island is pancake flat with a pebbly coast. The Alegre guitar factory (which also makes and sells mandolins and a local ukulele that uses a coconut shell for the sound box) is an interesting stop. Keep your eyes peeled for Bigfoot film production and television studios, a large orange square, out of which trickle homegrown (and a few imported) celebrities. Mactan prowlers can also head to a shooting range and squeeze off 20 rounds on an AK-47 or equivalent for around P2,000. No kidnappings allowed, though. The shooting range is not in a tough part of town. It's rather accessible, being conveniently located smack inside the family-friendly Tambuli resort. Grab a gun and have some fun. "You haven't paid your bill sir." "Whaddya mean punk? Callin' me a yaller bellied liar…?" Elsewhere on Mactan (and indeed around Cebu) you'll find signs of the growing Korean influx – Korean grocery stores and Korean discos and KTVs. Koreans have in fact replaced the Japanese as the business mainstay of the island and you'll invariably find kimchi (spicy, pickled cabbage) on the menu, even for breakfast. Now that's a REAL breakfast. Forget namby-pamby Continental mush. Small wonder then that karaoke parlours everywhere have prominent signs posted for GROs or guest relations officers. These nubile and nimble ladies can have quite an impact on your wallet if you don't watch out. If you are looking for more of a testosterone thrill, lazy Sunday afternoons in Cebu are given over to cockfights. Pay from P20-P200 entry. Fights start around lunchtime and continue till around midnight. Ask your concierge for details of your nearest cockfight to add some real Filipino flavour to your visit – not one for the kids, or vegetarians. Most savvy holidaymakers come to Cebu for the reefs and coral, not all destroyed by dynamite fishing. The Cebu region is known to offer some of the best dives in this part of Asia. The action is underwater. Serious divers will head to the balmy white-sand shores of two picturesque islands off the far north coast of Cebu, Malapascua and Bantayan. Malapascua, known for its thresher sharks, has a reasonable selection of resorts and eateries. The islands are a three-hour drive north from Cebu City and a short ferry ride. Ferries from Maya to Malapascua take around 30 minutes while boats from Hagnaya to Bantayan take around an hour. For something quicker, the waters around Olango Island (which is visible from Mactan), in particular the protected Marine Sanctuary off Gilutongan Island, offer coral and fish closer at hand. Or, for an upscale dive holiday with some spa pampering, consider the Badian Island Resort & Spa which is reviewed later in this article. Work out your geography on this Cebu Map with cities and resort locations. The Imperial Palace Waterpark Resort and Spa adds weight to the Mactan hotel line-up with 556 rooms and a waterpark, a kids’ club for the tots, and a poolside Cabana Lounge replete with flatscreen TVs and DVD players. 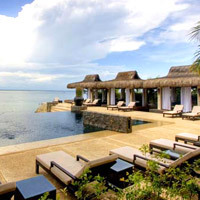 Also in Mactan is the sprawling Crimson Beach Resort and Spa spread over six beachfront acres. Expect 250 rooms and 40 villas, 38 plunge pools and a spa with a broad menu from Shiatsu to yoga. Rooms start at 36sq m with balconies while Garden Suites offer 44sq m of stretch space with a 42-inch TV and a second smaller screen in the washroom for more lazy soaking entertainment. Beachfront villas expand to 115sq m of space – enough to swing a horse by the tail. For the more soberly inclined there’s the Grand Coral Ballroom that can hold up to 600 people theatre style. For families, the pick of the bigger resorts on Mactan has long been Shangri-La's Mactan Resort and Spa. Set discretely in generous grassy acres with coconut trees, flowering plants and jogging trails, this is the getaway that put Cebu on the map when it opened in 1993. It's easy to see why. The spacious 547-room resort has two pools, putting greens, tennis, a private white-sand cove and more watersports than you can shake a stick at – snorkel the house reef, dive, jet-ski, fish, windsurf, parasail or head out to view coral in a glass-bottomed boat. In case you're at a loss to choose, check out the hotel's daily scheduled activities that range from billiards tournaments to zumba and tennis. There's even a weekly beginner's chess lesson poolside. Scotty's Dive Centre (tel: [63-32] 231-5060, e-mail: dive@divescotty.com or www.divescotty.com) handles underwater adventures starting at US$50 for beginners. For pinstripers on the go there are ample meeting facilities, a business centre, and high-speed inroom Internet access. A US$8 million renovation in 2013 brought fresh spring to its step some years back and the upgrades continue with a hi-tech Mactan Ballroom as the newest addition. Ocean Wing has its own dedicated entrance and staff, and enjoys sea views but can get a little noisy when the pool is in action. 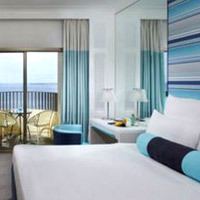 The bright and airy rooms, each with a balcony, are modern with Filipino touches like the woven sea-grass headboard. There are coffee and tea-making facilities, an iron and ironing board, a good range of toiletries and, civilly, a separate bar of soap in the shower cubicle so there's no last-minute scramble for suds. The inroom safe, alas, is not big enough to store a laptop but will handle a camera and video with ease. The Shangri-La offers a wide range of restaurants; the favourite and worth a visit even if staying elsewhere, is Cowrie Cove, now with a roof by popular demand. 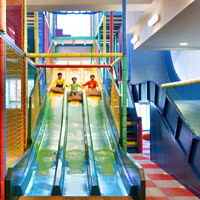 Superb children's facilities include a three-level Adventure Zone, a Toddler Zone and an E-Zone with enough arcade games to make you forget about that shining sun and warm water, almost. There's also a separate children's pool and dedicated aqua-play areas. If none of this grabs you, switch on the telly and croon along to the karaoke channel. Or grab a club and try your luck at the six-hole mini golf course. Another feather in its cap is the CHI Spa Village with six luxurious 135sq m villas and several treatment pavilions that is still the top option for Cebu spas in Mactan. Try out the "aromatherapy salt rubdown" or the "cooling cucumber slush" but don’t leave without enjoying the Filipino Hilot massage, complimented by CHI’s tanglad (Filipino lemongrass) scent and oil. A water garden features hydro tubs, herbal steam rooms and body-scrub salas. Shangri-La is the sort of place you could easily spend a weekend in without needing to go out at all. And if romance is in the air, the place doubles as a splendid Cebu resort weddings pick with acres of space and nice bay vistas with shocking blue backgrounds. Next door, the pink towers of the Mövenpick Hotel Mactan Island Cebu (formerly Hilton Cebu Resort & Spa) are the only seriously vertical structures you'll find on Mactan. The hotel certainly provides a vivid landmark, thrusting up from the flatlands in agitated pink with a blue roof. Rooms are a little on the small side at 33sq m but the views are superb with extensive seaside facilities to match. For more elbow space, opt for one of the Premium Ocean Front rooms, which give you a more generous 45sq m, replete with a private balcony to enjoy the sweeping views. Once done exploring the powder blue and cobalt stripe rooms with their large flat-screen televisions, check out the swinging Ibiza Beach Club, the all-day dining Sails restaurant, and some versatile function areas for small corporate meetings in Cebu should you be in the mood to work. If you are angling for some serious boutique luxury and a little more peace and quiet, the best choice in the area is abaca boutique resort + restaurant. Nestled in Punta Engano, a peninsula at one corner of Mactan Island that hosts a few other resorts along one road, abaca started off as a restaurant, and grew. Exclusivity reigns with only six suites and three villas, each with its own personal butler, 47-inch TV, DVD, wired and wireless Internet, iMac, iPod docking and an iPod available to borrow. Large bathrooms host abaca’s own plant-based toiletries, rainshower, twin vanities and separate stone bathtub. Enjoy breakfast on your balcony each morning and try a private cabana for dining or spa treatments. Dark wood and stone are stylishly appointed with Filipino antiques sourced from some of its 7,107 islands. There is a black-tiled infinity pool, indoor-outdoor spa, gym, as well as the resort’s signature restaurant. Visit, even if you aren’t staying the night, for stunning ocean views and Mediterranean-influenced Californian cuisine. Directly next door, and looming over the nine-room abaca, is the 161-room Be Resorts Mactan (formerly Microtel). A hip, Ikea-style lobby plays about with funky furniture and lots of white. Rooms are simple and clean, with desk, flat-screen TV, and fridge. Suites offer sofa-beds and a handy microwave oven for quick family feeds. Be Resorts is a family-friendly hotel that covers the mid-range accommodation needs on Mactan with a handy throw of water sports (think banana boats and jet-skis) and other activities (Nintendo's Wii, table hockey and billiards). There is a children's play area too. This hotel offers a compact footprint but has a playful attitude and provides a small roped-off beach section too. Midway down Mactan's east coast is the Maribago Bluewater Beach Resort. This is a pleasant resort with freeform pool, sandy walkways and thatch-roof cottages on the beach. It also offers an enclosed lagoon for swimming. The rooms have parquet floors and some offer verandahs. The renovated Italian restaurant is the newest rejuvenated offering, along with a few more doubles, or “premium deluxe” rooms. All cottages have two double beds, which serve just two persons. It’s three persons maximum – when a third bed is provided. Cebuanos like their stretch space. Rooms are simple and smart with splashes of red to brighten things up. Bathrooms are large and more spoiling than the room. Spend your time preening or relaxing in the separate bath. The 36-inch TV has cable. In Cebu this can include everything from CNN and BBC to Korean and Indian as well as the obligatory stations pushing skin-whitening cream. There is no huge safe in the room so if you're lugging around the Kashoggi jewels you'll need to park them at reception. Snorkelling is decent here. Try around Maribago’s own manmade island. Maribago Bluewater is a child-friendly Cebu resort. Around the corner is Tambuli. This is a once-throbbing has-been - a three-in-one resort strung along the beach. There's Tambuli East with standard and superior rooms, Tambuli West, with 'deluxe' rooms, and the Cebu Beach Club with barracks-style thatch-roof cottages set in gardens. The place has got run down and has a derelict feel with elusive contacts. Not for the quality conscious. The place is friendly but a tad rough around the edges and rooms border on the tacky with the colour scheme spanning everything from yellow and green to pink. There is no safe. Kids will enjoy the pool. The beach is just so-so. As a mid-range choice, the complex is fine and functional, especially if you have small kids. Try a 25 minute "seawalk" in a pressurised bubble mask with a tube feeding oxygen. 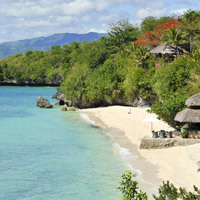 The small and cosy Cebu White Sands Resort and Spa at Maribago Beach is not far from here. There are 48 rooms on offer and more in the offing. The place is quiet, grassy and not overrun by screaming toddlers. The accommodation is in two-storey white-stucco villas with dark timber balconies. Rooms feature parquet flooring with wrought-iron chairs and table in the balcony. Both TV and bathroom are small and nothing to write home about. The mini-bar serves Coke or San Miguel beer for just P72. For the safety box, however, you'll have to head to reception. The focal pool area is large and nicely developed. 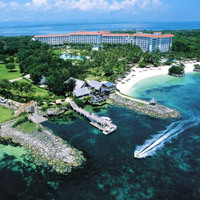 At the far southeastern corner of Mactan, is the much hyped Plantation Bay Resort and Spa. What sets this place apart from most is the fact that it's entirely "artificial". So what does that mean? Well, the lagoon, around which the resort is constructed, is really one vast concrete mould. Plantation Bay is an enormous sand-lined bathtub ringed by villas. Outlandish as this may sound, the effect is rather pleasing and the two-storey villas are attractive both in and out. The public beach nearby is undistinguished and one can see why the owners went to such lengths to create this fantasy. The lagoon is ample and well spread out with a variety of water experiences from giant slides to pedal-boats. The pool underwent major renovations in recent years, and now boasts underwater lights that pulse and shift through a myriad colours. Around the lagoon are hammocks and meandering cycling/jogging tracks. A Waterside room is just "5-10 seconds from the water". Fair enough. A Water's Edge room, however, is just "0-2 seconds from the water". Whoops. SPLASH. And splash indeed, into any one of four pools – three freshwater and one saltwater. Swim to the pool-centre hammocks for a swing in the sun. You needn’t even wet your little toe, however, with activities like archery, mini golf, climbing, karaoke, and a firing range on top of all the usual suspects. Plantation Bay farms its own prawn and crab to supply fresh seafood to its four restaurants. This is a good choice among Cebu family resorts for those with teenagers in tow and, of course, anyone with Attention Deficit Disorder. Those searching for an ideal sunset experience can check out the humorously named Alien Abduction Cafe, an ice-cream parlour by day and cocktail lounge by night. Apart from its child-friendly facilities, this is a good Cebu resort weddings venue with several angles for great photo ops. Something a little more serious, for businessmen, gamblers, or people who just love watching planes, there's the slick Waterfront Airport Hotel & Casino Mactan. It has a Cebu sister property that borders a bit more on Disneyland, the Waterfront Cebu City Hotel & Casino. Also in the neighbourhood is the Cebu Parklane International Hotel. This business hotel has 241 rooms on offer with sizes ranging from a superior room to the penthouse suite, all with complimentary WiFi. Business travellers can take advantage of the business centre or conference and banquet spaces. Don't forget to check out the swimming pool and Jacuzzi on the fourth floor or hit up the spa to unwind. A couple of hours drive north from Cebu City, along the east coast, is the pleasant farming and fishing area of Sogod. 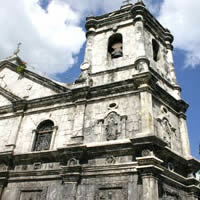 The drive takes you through Danao which has an attractive city square and an old cathedral. Just after Sogod, about 80km from Cebu City, is the fashionable Alegre Beach Resort. 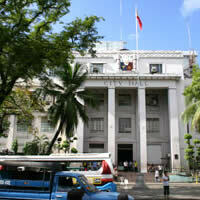 It is worth noting that should you be one of those that enjoys resort-hopping, security all over Cebu is a real pain. It is difficult to enter most upscale resorts if you are not staying there. Cebuanos themselves have trouble getting in most times. The entrance to every compound is manned by guards so be prepared for car-trunk checks, mirrors to scan the undercarriage, and even sniffer dogs. Always wear clean underwear. Alegre is a lovely spot, a true getaway, intimate, green, with walks through coconut groves, hibiscus and bougainvillea clusters, an extensive orchid farm and a nice private beach cove. The (real) white sand beach sets off the inviting blue of the water. A sign here reminds guests that they should wear "proper attire" at all times. This means "swimsuits for ladies and swimming trunks for men". The private villas have thatch roofs and spoiling bathrooms. Grab a Coke, a San Miguel beer, or more. If you’re truly lazing, try an in-room massage. Snorkel or dive at the house reef where you might spot turtles and clown fish, or cruise out to Calangaman Island for a picnic on its sugar-white sandbar. Given the distance from Cebu City, Alegre’s 38 private villas are for honeymooners and a quieter set. Quick dashes into town for a drink or bar crawl (or brawl) are out. However, the resort does offer a complimentary shuttle into Cebu City three days a week, departing 9am and commencing the return journey at 4.30pm, so you will manage to get some shopping done. With meetings facilities for small gatherings Alegre scores with business travellers as a secluded conference hotel but it is a great away-from-it-all choice for all comers. An hour's drive south from Cebu City in the San Fernando area, the Japanese-run Pulchra is a sight for sore eyes, especially after negotiating the highway roadworks and traffic tail-backs. Everything about the place is immaculate from its crisp landscaping and minimalist Zen lobby to the infinity pool and the 37 chic thatch-roof villas and lagoon suites. Pulchra has drawn much of its design inspiration from Amanresorts and, like its idol, the accent is on simplicity and unobtrusive service. Staff is friendly and welcoming. The resort is set around a natural cove, sanded artificially with the best powder from the south. Cottages are split-level with the beds occupying the raised area, looking over the living room. Floors are marble, pastel furnishings and fabric has been well chosen and, bravely, there is no inroom TV. Each villa and suite also comes with its private pool and lanai. Now this spells class. There is a television at the bar so you won't miss out on the football or the latest Iraq spat. Laundering a shirt costs P40, and a skirt, P45. The safe is small and won't take a laptop and the instructions are in Japanese. 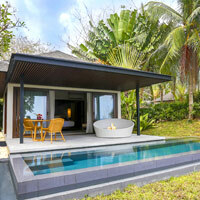 Pulchra also offers four larger two-bedroom pool villas as well as two spa treatment villas for a relaxing rubdown. Offshore options include a snorkelling trip to Cabilao Island an hour away (9am-4pm, P3,600). If your wallet can manage it and you want something secluded and posh, Pulchra is a must-see. 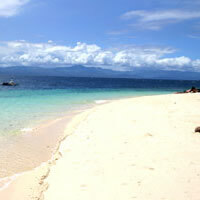 If a tan – and sand – is all you want, drive across to the island's west coast to Moalboal's quiet White Sand Beach. Yes, it is white and natural, as God intended. Moalboal is around a three-hour drive from Mactan through scenic hill roads with wonderful views of the coastline and the neighbouring island of Negros. Panagsama Beach has small chalets and restaurants though the beach has been wrecked by breakwaters jutting into the sea. A lovely spot to break journey here for lunch (or a stay) was Hannah's Place. Hannah's was a comfortable spot fronting the ocean with a charming open-sided thatch-roof restaurant that did crêpes, pastas and even Indian curries. Dives were arranged through Sea Quest Dive Center (www.seaquestdivecenter.net). Possibly after a change of owners the place became a Korean restaurant, a derelict hangour, and then disappeared from the map. Quo Vadis Beach Resort is another comfortable garden option with pool, kids' facilities and a choice of deluxe rooms (with aircon and bathroom) or cottages (fan and balcony). Try their Arista Restaurant for German/Filipino nosh. Some of the best views to be had are from the bathtub. Rooms have a CD player (CDs are available from the library) but no TV (there is one in the clubhouse). But you can stay connected with the free in-room WiFi. There are coffee and tea-making facilities and a minibar. Laundering a shirt is a steal. Bring all your laundry along. An attractive feature here is the Badian Natural SPA with thalasso, offering massages, facials and other treatments. The one-hour "Island Paradise Massage" combining Indian Ayurvedic, Chinese and Thai techniques is US$75. The resort offers a freshwater swimming pool and extensive dive and watersports facilities. 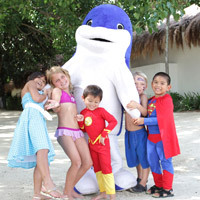 The Badian Dive Center follows PADI standards and offers a "discover scuba diving program". Dives in the area range from beginner (Coral Gardens) to experienced (Sunken Island between Cebu and Negros). Also check out their specialty courses including night diving, underwater navigation and underwater photography classes. There are as many as 15 dive locations within a half hour boatride from Badian Island Resort. Driving into Cebu City, as opposed to actually staying there on business, can be a shock to the system. But once in, there's much to do and enjoy. The old and more colourful parts of downtown Cebu around atmospheric St Nino and City Hall are fun to browse. Hop on a calesa and trot off. Colon Street, named after Christopher Columbus who had a bit of a navigation problem that fortuitously prevented him tangling with Lapu Lapu, is the oldest street in town and a lively artery of commerce and entertainment. Head to Carbon Market for all your Filipino handicrafts, flowers, and street food amongst what is the lifeblood of Cebu. Once the tourist souvenirs are out of the way, watch life unfold around the secondhand clothes, fruit and vegetables, fish and meat in the early morning, and every useful household product or instrument known to man. A pleasant vantage point from where to survey the land – or the lights depending upon your time of visit – is the hilltop Tops (P100 entrance fee). 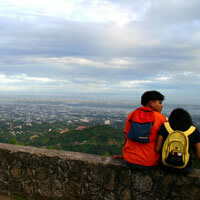 Have a picnic basket made up at delicatessen The Tinderbox (tel: 234-1681) and head to this open lookout point from where, with a foaming San Mig in hand, you can survey Cebu City, Bohol and the mountains to the north. Evenings finds families, lovers, students and tourists sitting atop the encircling wall enjoying the cool dusk breeze. Here you'll find snacks, drinks and little stone alcoves arrayed in a semicircle if you wish to have a roof over your head. There's also an iron bell that, according to lore, is rung "once for firm partnership, twice for lasting friendship or three times for never-ending love." Start counting. The winding drive up the hill takes around 30 minutes from the city. A taxi will charge around P150 per hour and a motorcycle hubel-hubel upwards of P30 per passenger. On the way down you might stop at the Italian La Tegola which offers great views and is open to the breezes. It's a simple, if romantic, pitstop with decent pasta. Two more branches have opened in Mactan and Cebu Business Park. Slightly lower down is the Chateau de Busay (tel: 231-2000), a more upmarket villa with a garden (where alfresco meals may be enjoyed) and equally stunning views. Steaks and meats are the order of the day. Also on these slopes is the quirkily-named Mr A (tel: 232-5200) with great views, a pub atmosphere and a younger set. Pop in for a drink. The most interesting Filipino dining experience is still to be had at the Golden Cowrie (tel: 233-4670) where and you eat on banana leaves under the high timber rafters of an old house. There's indoor and outdoor seating and the food is excellent. The owner Earl Kokseng knows a thing or two about catering as he runs a few of the better known eating establishments. Not too far from here, opposite the Waterfront hotel, is The Walk, a standalone complex of fast-food eateries and local shops. In town, for more Italian, try Bona Forchetta on Osmania Boulevard or Giuseppe's, near the gate of Maria Luisa Subdivision for Sicilian/Italian and the best thin crust pizzas in town. Gustavian, just a shimmy down the road from Giuseppe’s, is a great sports bar and diner (owned by Michel Lhuillier, father of the famous New York fashion designer Michelle Lhuillier who dresses Hollywood celebs and sells her creations in Harvey Nichols). Cebu shopping options focus on a few large malls – SM City (Shoemart) in the North Reclamation Area close to the coast, and Ayala Center in Banilad further inland. SM City is a multi-level modern beast (among the biggest in the Philippines) with Australian coffee outlets and an array of choice restaurants. Spice Fusion (tel: 238-9591) and Lei Garden come highly recommended. Kipling, Timberland, Columbia Sportswear, Adidas, Guess, Giordano, Hang Ten, Naf Naf and Pro Mod are just some of the names SM City has attracted. Check out its “native” food section for the best dried mangoes and otap (a sugared cookie delicacy native to Cebu). Ayala Center is a bit more laid back with smaller, boutique-size shops which some big names have squeezed into, like Lacoste, Steve Madden and Levis. Register at the Turista Desk for “perks and discounts” (Level One, Paseo Marina). The Terraces is a welcome addition to Ayala Center, bringing a long string of decent restaurants – CYMA is a good choice for Greek cuisine (tel: 417-1351). Crossroads Arcade, next door to Tinderbox in Banilad, is another restaurant complex which livens up each evening with some of the more high-class Cebu City restaurants. Maya tequila bar and restaurant (tel: 238-9552), offshoot of abaca, is a Mexican delight with over 90 tequilas shaking things up for high flyers. Try Vudu Private Lounge for tapas (tel: 420-7070), or Olio for Italian. Other munching choices include the popular barbecue spot Larsian sa Fuente (Fuente Osmena, Cebu, close to Chong Hua hospital), with an assortment of skewered pork from P4 per stick, and the Maya Tequila Bar & Restaurant with affordable and zesty Mexican nosh, under the watchful eye of chef Jason Hyatt who also manages the chic Abaca restaurant and resort. You can try your chances with the many Thai massage parlours dotted around the city, but if you don’t want to sprain muscles you didn’t know existed, it’s best to use day spa The Spa (tel: 4120-888 or 3451-777). 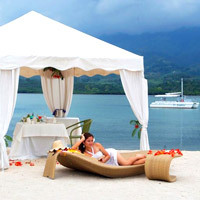 This is a very professional affair, based in Banilad, with a huge spa menu catering for every taste and pocket. For most treatments there are rates for “common”, “VIP” and “couples with steam”. They also offer several deluxe packages for the full relaxation experience, including "Pamper Me" which has a foot bath, choco-cocoa body wrap, seaweed bath, Swedish body massage and a foot massage for P3,600. Back in Mactan, the Marina Mall offers a La Tegola, Magellan's Landing and the Majestic Chinese Seafood restaurant which, although a little jaded, is still frequented for its coconut crab, live eel with black pepper sauce and decent lunchtime buffet, P275. High rollers will have plenty of opportunity to flush, or flash, their cash at the casinos at the two Waterfront hotels in Cebu and near Mactan airport. Cebu does not offer huge choice when it comes to international standard business hotels. There is the brisk Cebu City Marriott Hotel, the palatial and overly grand Waterfront Cebu City Hotel & Casino with high-roller tour-groups milling about the lobby, and the Summit Circle Hotel (rebranded from Cebu Midtown in 2012). Marriott would be the pick for discerning businessmen, just out of a total refurbishment of its lobby and rooms. The plush Waterfront has 562 rooms, 14 restaurants and outlets including Chinese, Japanese and Italian, and even a disco. And its Cebu International Convention Center offers 10,000sq m of space. The Cebu Midtown Hotel is really a last, or budget, choice if everything is full. It does have a good location but is a hell-hole of a place, built above the Robinson Mall as an afterthought with the drive to the hotel entrance corkscrewing up a dingy car-park ramp that ends up, well, in a car park. The Cebu Plaza, with a tremendous location up on the hill, has been reborn as the swank Marco Polo Plaza Cebu. Sited up on scenic Nivel Hills, this is a Cebu landmark, easy to spot from almost anywhere. The property encompasses a generous 7.5 hectares of landscaped gardens and waterfalls. There are 329 smart guestrooms with Broadband (P800 per day), 41-inch flat screen TV, compact bathroom and a shockingly small sink. The Continental Club floors (right at the top) offer executive extras like express check-in, and access to the Continental Club lounge where cocktails and snacks flow all day. This Cebu business hotel is a good and brisk venue for small corporate meetings or even as a bigger MICE venue. 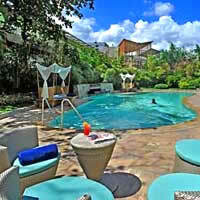 It is about 25 minutes from Mactan International Airport. Yet another international player is Best Western Plus Lex Cebu, which opened in 2014. The property serves up 57 rather standard rooms with free WiFi, television, safety deposit box and other mod-cons. Pinstripers can take a dip in the infinity pool, or work up a sweat in the gym. The hotel is conveniently located next to the small Escario Central Mall. Downtown, the Radisson Blu Hotel Cebu is connected by a walkway to the SM City Cebu Mall, a monster shopping distraction. It is also close to the Cebu Convention Center as well as the port. Well-appointed and modern Deluxe rooms starting at 35sq m serve up a 37-inch flat-screen TV, iPod dock and – listen up business travellers – free WiFi. The 46sq m Business Class Deluxe rooms offer Club Lounge access, breakfast and views of either the City or the Mactan Channel. This is a brisk address for pin-stripers in search of a Cebu conference hotel and the pillar-free grand ballroom can host 1,200 people theatre style. Two newer offerings with fewer frills and attractive prices are the Islands Stay Hotel (opened March 2011) on Archibishop Reyes Avenue, Cebu City, close to Ayala Mall, and its sister hotel (opened April 2011) on ML Quezon National Highway, Mactan. Take your pick with rooms starting at below P,1,000. Nextdoor is the relatively new Bayfront Hotel Cebu (opened 2015). This mid-range hotel offers 168 rooms with simple, clean interiors and pale interiors. There's a conveniently located 7-Eleven on the ground floor and a gym for those looking to burn some calories. Or hit up the Oriental Spa for some soothing treatments at the end of the day. Further inland is the quirky Henry Hotel Cebu, a black cinderblock building that belies its colourful interiors. Stepping into the lobby feels like walking into a modern art museum, with colourful pieces strewn throughout the space. The 38 rooms on offer are spacious and decorated in swatches of bold colour and adorned with pop culture art pieces. 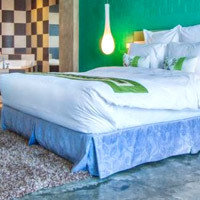 Pick this as a Cebu boutique hotels choice. Why not go with a 72sq m Extra Large room in green with a face painted across the wall? Nightlife is reasonably lively and things start rocking after 8pm when most of the bars open for business. The go-go dance places are concentrated on Mango Avenue (now General Maxilom) with musty red-draped establishments like Viking, Papillon and the slicker Blackhole. Another club vying for the sweatiest venue medal is Cassanova Superclub, where you can party “11am till dawn”. Head to the Reclamation port area for Arena, a bigger place with more scantily-clad dancers who will come up and enquire, "May I know yourrr nationaliteeeeee sirrr?" Should you get involved in further discussions regarding your nationality, income and wedding prospects, the ladies will likely order tequila rounds that are a tad more expensive. Not too far from Mango Avenue is the top-end Jaguar KTV and go-go dance place that is in a plush theatre, rather than bar, set-up. Music buffs will enjoy hanging out at Jazz and Blues while the more energetic, or totally plastered, can head to head-banging discos like Pump (near Ayala Mall) or the Korean-run Sunflower and NASA, close to Goldfinger which heads the Mandaue clubbing scene. Of course if all this doesn't appeal or you're simply knackered, head back to your hotel, switch on the TV and watch a skin-whitening programme. I think I'll buy some of that Herbal P-Gel. One last tip before you dash home – make time in Mactan Cebu Airport’s tiny duty-free area to pick up some creamy mango ice cream (Magnolia is a good brand) which, packed with dry ice, you can check-in with your luggage. Just south of Cebu is the island of Bohol with more romance and adventure than you can shake a stick at. Fall in love, get married, try your luck at a sunset proposal. 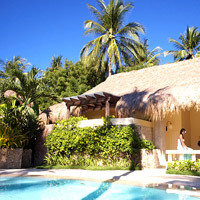 Our pick is the luxe Amorita Resort by the One-Of Collection tucked away on secluded Panglao Island (and conveniently connected to the main Bohol Island by bridges). 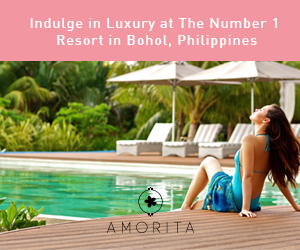 In 2017 this Bohol luxury beach resort brings guests "Love Amorita" - a romantic experience with the introduction of 16 Luxury Villas and two fresh Two-Bedroom Pool Villas for a candlelit "I do" or for families in need of some extra stretch room. It's easier than ever to pop over with the resort's 'Perfect 10' package that runs right through the year starting from P10,000 per night (for a minimum two-night stay) with luxe digs for a couple inclusive of breakfast, a paella dinner, pizza at Saffron, transfers, and head-and-shoulder massage for two at the Sea Tree Spa. 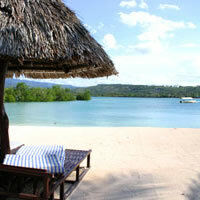 The resort is sited on a low headland with grand views over the southern stretch of Alona Beach. Expect complimentary WiFi, paddleboards and kayaks for some salt-in-the-hair workouts. The resort's smorgasbord also includes 98 swish Suites, two sun-drenched pools and new twists on menus with some hard-to-find local Bohol fare. There's a dive centre for those interested in deeper explorations. Expect cool rustic stone floors underfoot, pastel or yellow walls, breezy verandahs to settle in with a good book, flat-screen TVs and an attractive minimalism. This award-winning escape is a 40-minute drive from Bohol’s Tagbilaran Airport. Fast ferries link Bohol to Cebu with a cruise time of around an hour and a half. So if you're shopping for Bohol dive resorts with a child-friendly appeal yet smart and secluded enough for lovers to get gazing at the stars, Amorita could be it. Also on Panglao Island is the larger hotel-style Hennan Resort Alona Beach, sprawled over 6.5 hectares with 400 rooms - big enough for the 1,000-person convention centre - three cobalt-blue swimming pools, and a spa. There is space enough for small Bohol corporate meetings here or a bigger destination wedding event. Also consider the renovated Bohol Beach Club with 88 bright new-look rooms and suites for the unfussy traveller and a good stretch of beach; the upgrading Mithi Resort & Spa with its stretch of private white sand; and Bluewater Panglao Beach Resort with functional rooms, smart villas (some with private pools) and a decent spa. The Eskaya Beach Resort & Spa is a high end well spaced out 16-hectare property with an excellent hilltop spa and a range of Family villas and Pool villas. There is secluded space for all comers. It is a member of the Small Luxury Hotels of the World group and this is reflected in the rates. Eskaya is a non-smoking hotel, which will appeal to eco-trippers. Less appealing is its insistence on clamping down on any photography except for 'personal purposes' - a bit stodgy and unwarranted in this day and age and quite unusual in the Philippines. The dry season is from December till May. The rains and typhoons start in June. Room rates may be subject to a 10 percent service charge and 11 percent government tax. Rates quoted here are a mix of rack rates (or published rates) and the best rates offered by these hotels on the Internet. Rates fluctuate daily, so check. For a sense of direction and scale, look at our Cebu Map. The exchange rate is about US$1=P48. Mactan-Cebu International Airport receives flights from Tokyo, Seoul, Hongkong, Singapore, Doha and charters from Taiwan. For dive assistance talk with the friendly and free-wheeling Gary Cases at Divelink Cebu (tel: [63-32] 437-0044). And for luxury bespoke tours, drawing on a strong local network, try Global Nomad (e-mail: info@global-nomad.com or www.global-nomad.com). Bayfront Hotel Cebu. Tel: [63-32] 230-6777, fax: 230-6767, (e-mail: info@bayfronthotelcebu.com or reservations@bayfronthotelcebu.com or www.bayfronthotelcebu.com/). Best Western Plus Lex Cebu. Tel: [63-32] 416-5511, (e-mail: hotel.info@bestwesternlex.comor www.bestwesternlex.com/). Cebu City Marriott Hotel. Tel: [63-32] 411-5800, fax: 415-6101, (www.marriott.com). Cebu Parklane International Hotel. Tel: [63-32] 234-7000, (e-mail: info@parklanehotel.com.ph or www.ishop.com.ph/parklane/). Islands Stay Hotels. Tel. [63-32] 316-9976, fax: [63-915] 539-4118, (e-mail: booknow@islandsstay.com or www.islandsstay.com). Marco Polo Plaza Cebu. Tel: [63-32] 253-1111, fax: 234-8170, (e-mail: mpplaza@marcopolohotels.com or www.marcopoloplazacebu.com/). Radisson Blu Hotel Cebu. Tel: [63-32] 402-9900, fax: 402-9999, (e-mail: reservations.cebu@radisson.com or www.radissonblu.com/hotel-cebu). Summit Circle Cebu. 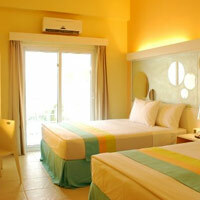 Tel: [63-32] 239-3000, (www.summithotels.ph). The Henry Hotel Cebu. Tel: [63-32] 520-8877, (e-mail: reservations.cebu@thehenryhotel.com or www.thehenryhotel.com/sleep/cebu). Waterfront Cebu City Hotel & Casino. 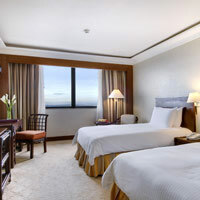 Tel: [63-32] 232-6888, fax: 232-6880, (wcch@waterfronthotels.net or www.waterfronthotels.com.ph). abaca boutique resort + restaurant. Tel: [63-32] 495-3461, 236-0311, (e-mail: relax@abacaresort.com or www.abacaresort.com). Be Resorts Mactan. Tel: [63-32] 236-8888, fax: 236-8088, (e-mail: info@beresorts.com or www.beresorts.com). Cebu White Sands Resort and Spa. Tel: [63-32] 268-9000, fax: 495-2080, (e-mail: cebu@whitesands.com.ph or www.whitesands.com.ph). Crimson Beach Resort and Spa. Tel: [63-32] 401-9999, fax: 401-9998, (e-mail: info.mactan@crimsonhotel.com or www.crimsonhotel.com). Imperial Palace Waterpark Resort & Spa. Tel: [63-32] 494-5000, fax: 494-5001, (e-mail: rsvn@ip-cebu.com or intelaface.com/demo/imperial/ ). Maribago Bluewater Beach Resort. Tel: [63-32] 232-5411, fax: 492-0128, (e-mail: maribago@bluewater.com.ph or www.bluewatermaribago.com.ph/). Movenpick Hotel Mactan Island Cebu. Tel: [63-32] 492-7777, fax: 492-7704, (e-mail: hotel.cebu@movenpick.com or www.moevenpick-hotels.com). Plantation Bay Resort and Spa. Tel: [63-32] 236-9040, 505-9800, fax: 340-5988, (e-mail: inquiry@plantationbay.com or www.plantationbay.com). Shangri-La's Mactan Resort and Spa. Tel: [63-32] 231-0288, fax: 231-1688, (e-mail: mac@shangri-la.com or www.shangri-la.com/cebu/mactanresort/). Waterfront Airport Hotel & Casino Mactan. Tel: [63-32] 340-4888, fax: 340-5862, (wahc@waterfronthotels.net or www.waterfronthotels.com.ph/). Badian Island Wellness Resort. Tel: [63-32] 475-1103, fax: 475-1101, (e-mail: salesreservations@badianwellness.com or www.badianhotel.com). Budyong Beach Resort. Tel: [63-32] 438-5700, (budyong.byethost7.com/?i=1). Santa Fe Beach Club. Tel: [63-32] 438-9090, (e-mail: info@stafebeach.com or www.stafebeach.com). Malapascua Exotic Island Dive & Beach Resort. Tel: [63-32] 516-2990, (e-mail: info@malapascua.net or www.malapascua.net). Quo Vadis Beach Resort. Tel: [63-32] 474-0018, (e-mail: roachdown@aol.com or www.moalboal.com). Pulchra. Tel: [63-32] 232-0823, fax: 488-9292, (e-mail: info@pulchraresorts.com or rsvn@pulchraresorts.com or for Japanese, cebu.jp@pulchraresorts.comor www.pulchraresorts.com). Alegre Beach Resort & Spa. Tel: [63-32] 513-3821, fax: 254-9833, (e-mail: info@alegrebeachresort.com or www.alegrebeachresort.com). Amorita Resort. Tel: [63-2] 533-9549, (e-mail: sales@one-ofcollection.com or www.amoritaresort.com/). Bluewater Panglao Beach Resort. Tel: [63-38] 416 0695, (www.bluewaterpanglao.com.ph/). Bohol Beach Club. Tel: [63-38} 502-9222, (www.boholbeachclub.com.ph). Eskaya Beach Resort & Spa. Tel: [63-2] 654-6480, (www.eskayaresort.com/). Hennan Resort Alona Beach. Tel: [63-38] 502-9141, (henann.com/bohol/). Mithi Resort & Spa. Tel: [63-38] 411-2599, (www.mithiresort.com/).